•	is a membership organisation. 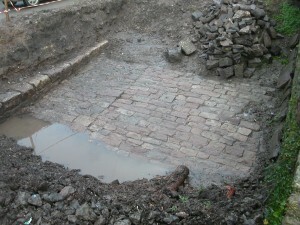 Our current project, which is already underway, is to restore the ancient slipway at Fryers Wharf in Tintern. This was almost certainly the site of the Tintern ford mentioned in early documents where Tewdrig met the marauding army of Saxons.. 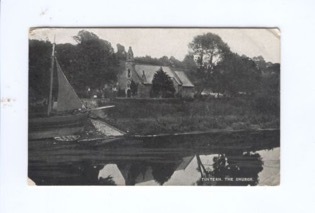 It was also an important location for river craft over the centuries but fell into disuse in the early 20th Century and was filled in. 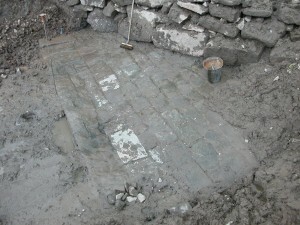 Grant money has enabled the Trust to open the top and bottom of the slipway to reveal an impressive stone structure. CADW has expressed their support for the project. The next phase is to remove the pumping station and clear the rest of the slipway. Can you help with the next phase of the project to finally clear the slipway for all to see and use? Join the Trust and help in the work of the organisation and be kept informed of the progress. A membership application form can be downloaded as a PDF at the foot of this page. 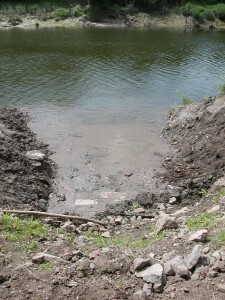 With financial help from the Tintern Community Council the top of the slipway was cleared revealing a 17’9” wide cobbled structure with a low retaining wall on the car park side. Clearly 2 different sections. Date uncertain at present. 2010 Top of the slipway. A second retaining wall was built above the historical one to retain the car park. iron ties. 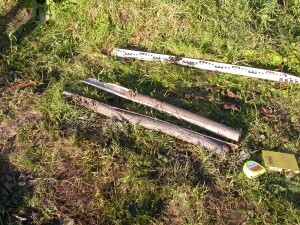 There is a large timber at right angles to the slipway, possibly a basal feature of the wharf. The alignment with the stonework on the English side of the river is strongly suggestive of a river crossing point - but from what period of history? 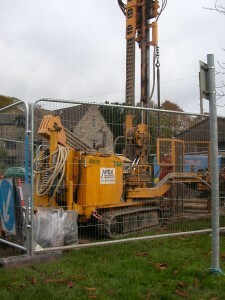 With grants from The Sustainable Development Fund, ‘Splash’, Monmouthshire County Council, Newgrove Trust and TCC various surveys were undertaken to assist Welsh Water in designing a new Sewage Pumping Station and to assess the stability of the church wall. 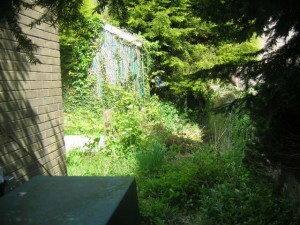 An archaeological watching brief was undertaken for the works. 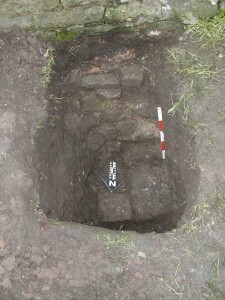 Archaeological trench behind church wall. Awaiting removal of the pumping station and slipway clearance and repair. Tintern Parva is the oldest end of the village. The estate existed before the Cisterians built the famous Abbey. ‘Little Tintern’ is mentioned in the Liber Landavensis in the ninth century. The ‘Tintern Ford’ is also mentioned here and the Battle of Tintern in the 7th century is also documented. Throughout the centuries the owners of the estate had large vessels that would have used the wharf and slipway. It was also used as a place to alight in Tintern during the Wye Tours of the 18th and 19th century and was still in use in the 20th century in the timber trade. More details on the history can be found here. The project provides an important opportunity to inform of the importance of the history of Tintern Parva that has been overshadowed by the Abbey. We have provided an interpretative display board at the top of the slipway. Local schools and groups such as the Welsh Battlefields Association have visited. Local and long distance walks pass the top of the slipway and on through the churchyard; our members meet and greet these walkers, and visitors who stay in the local Parva Farmhouse and Wye Valley Hotel. The lower Wye is tidal and its banks are therefore very muddy. There are no good points for safe access to and from the river in Tintern. A restored slipway would be an important feature for this purpose and provide a landing stage for small craft, canoes and kayaks. It would also bring more tourist trade to the businesses at this end of the village. the 7th century. The removal of the existing Sewage Pumping Station will improve the visual impact of this ancient site of worship and improve the view of the river frontage at this point very significantly. Whilst the restoration of Fryer’s Wharf remains the priority there are other historical and archaeological features in Tintern and the Lower Wye Valley that may benefit from the Building Preservation Trust in the future. Within less than a mile there are the sites of various old wharfs and slipways, only one of which has recently been refurbished, whilst the several roadways that converge on this river crossing might also repay some investigation. Where there has been research into our local buildings it appears many are much older than have been generally accepted.